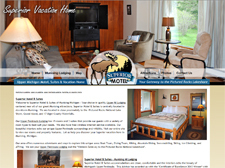 The resort, in the midst of the pristine Huron National Forest, has been providing Michigan lodging accommodations since the 1940's. Visit this lovely website located city of Munising Michigan - overlooking the Pictured Rocks National Lakeshore. They feature rustic lodging that echoes their surroundings. A place where the sunset actually do look like the one in the picture! Along with designing this website, we stayed at the Sunset Motel on the Bay - Super clean, friendly people, and a great view!